TORONTO — Thomas Chabot scored two goals and had an assist for the Ottawa Senators in a 5-3 win against the Toronto Maple Leafs at Scotiabank Arena on Saturday. Chabot got past Maple Leafs defenseman Igor Ozhiganov at the blue line and shot over goalie Frederik Andersen’s blocker at 1:42 of the third period to give the Senators a 4-3 lead. “As I got in the zone, I saw the defenseman kind of poke-check and open up his feet, so I knew I could try to squeeze it in between and go in on a breakaway, so I was pretty happy to squeeze in and put it in the back of the net,” Chabot said. Mark Stone scored into an empty net with 25 seconds left to make it 5-3. Dylan DeMelo and Chris Tierney each scored his first goal for the Senators since being acquired Sept. 13 from the San Jose Sharks in the Erik Karlsson trade. 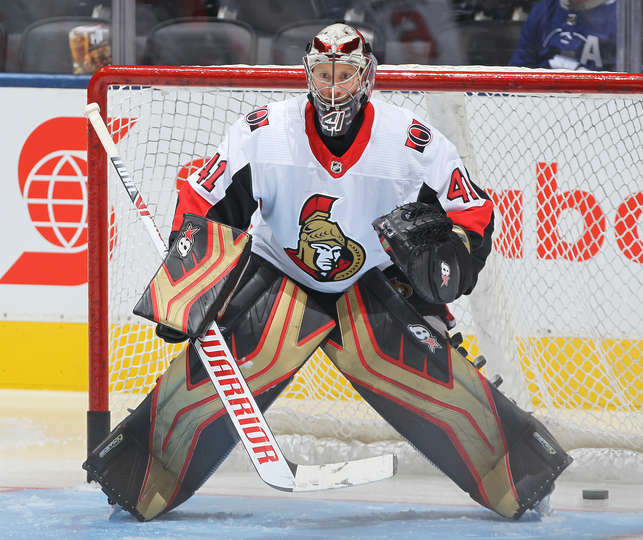 Craig Anderson made 34 saves for Ottawa, which lost 4-3 in overtime to the Chicago Blackhawks in its season opener Thursday. Morgan Rielly, Auston Matthews and Mitchell Marner scored for the Maple Leafs, who opened their season with a 3-2 overtime win against the Montreal Canadiens on Wednesday. Andersen made 19 saves. Marner scored on the power play to tie it 3-3 at 18:20 of the second period. He skated past Ottawa defenseman Mark Borowiecki, faked a shot, and beat Anderson past his glove with the goalie sprawled. Toronto tied it 1-1 29 seconds into the second period when Marner found Rielly with a cross-ice pass for a tap-in at the top of the crease. Matthews put the Maple Leafs up 2-1 at 1:10 after taking a pass from Patrick Marleau in the slot. Senators coach Guy Boucher said there was no panic on the bench despite quickly surrendering the lead. The Senators tied it 2-2 at 3:49 of the second when Chabot scored on his own rebound after skating around Maple Leafs forward Tyler Ennis just inside the blue line. Tierney gave Ottawa a 3-2 lead at 4:27 when he cut in on the left wing and shot between Andersen’s pads. The Senators took a 1-0 lead at 9:42 of the first period when DeMelo scored from the top of the right face-off circle. It was Chabot’s second two-goal game in the NHL (April 2, 2018, against the Winnipeg Jets) and his third three-point game. … Marner led the Maple Leafs with six shots on goal.